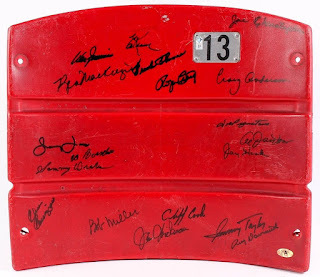 Offered here is a New York Mets Shea Stadium Seat Back which has been hand signed in black felt-tip pen by (19) including Ray Daviault, Don Zimmer, Ed Kranepool, Frank Thomas, Al Jackson, Bob Miller, Craig Anderson, Sammy Taylor, Sammy Drake, Jay Hook, Joe Pignatano, Cliff Cook, Roger Craig, Joe Christopher and others. See photos for details regarding the condition of the seat back. Mets: Hawaiian Punch Hit Towel? ?